China Daily, the national English-language newspaper of China, keeps you in touch with China and the World with our mobile solutions. Now anyone, anywhere, can tap into the world’s fastest-growing economy for our exclusive reports on news, insights, learning and fun. Download your favorites! The application helps you access the latest information and photos of China wherever you go. 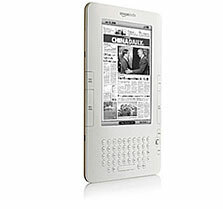 It syncs and downloads the latest news of China and the rest of the world directly to the device. Or go to 'Google Play Store' on your Android device.Select 'Search'.Enter 'China Daily' into the search field. Once you've found the 'China Daily' app, touch to install. A bridge connecting China and the world, China Daily iPhone application let you access the latest information and photos of China wherever you go. Specifically designed to utilize the features and navigation of the iPhone, this application syncs and downloads the latest news of China directly to the device. 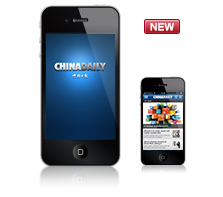 Looking to have China Daily at your fingertips? Then look no further than the Chinadaily iPaper app from NewspaperDirect. With The Chinadaily iPaper, all sections are presented as full-content digital replicas, in their original layout. The application is free, and you can link your existing account on Chinadaily Smart Edition to download your favourite publication wherever you are. China Daily introduces a new feature for the world’s newest mobile trend: the China Daily Digest application now available on the Apple iPad. China Dailys customized iPad app allows readers to read and download in-depth reports, website exclusives, features and analysis to give you unique insights into Chinas economy, society and culture. China Daily Video iPhone application is a window to China, lets you access video products covering all of Chinas intangible cultural heritages, natural wonders, interviews with celebrities and coverage of major news events. Touch China magazine is the definitive in-depth magazine showcasing all facets of Chinese culture. With its newfangled design and thought-provoking content, Touch China has managed to encapsulate the Chinese subtle way of life as seen through a wide range of lenses, from classic pieces and fine art to ancient traditions and rituals. China Daily’s US Edition is available on Kindle! Tailor-made for American readers and aims to facilitate public discourse and inspiring constructive dialogue between China and the United States, the newspaper helps you capture a holistic view of China's political, economic, social and cultural landscape. A bridge connecting China and the world, China Daily BlackBerry® application let you access the latest information and photos of China wherever you go. Specifically designed to utilize the features and navigation of the BlackBerry, this application syncs and downloads the latest news of China and the rest of the world directly to the device. 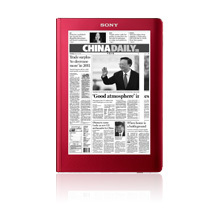 China Daily US Edition on Reader™ digital book(s) by Sony is tailor-made for American readers and aims to facilitate public discourse and inspires constructive dialogue between China and the United States. China Daily is China's national English-language newspaper, which was founded in 1981 and today has a circulation more than 500,000 worldwide. It is the only Chinese newspaper that has effectively entered Western mainstream society and is the newspaper most quoted by the foreign press. The paper also has published the largest number of supplements for international meetings in China among all media outlets. Global readers recognize China Daily as the most authoritative and influential English-language media in the country. It serves as an important window for "China to understand the world and be understood by the world." 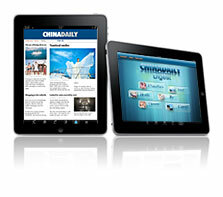 With China Daily SmartEdition, you can read China Daily online in its true printed format from anywhere in the world. The SmartEdition is enhanced with the latest digital tools, including RSS feeds, social networking, blogging and much more.